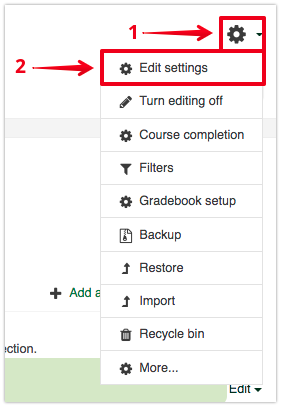 On your course main page, click on the gear icon near the top right, then on Edit settings. Then, navigate to the 'Appearance' category and change the value for ‘Announcement items to show’ from Zero to any value. Be sure to click on Save changes at the bottom of the page to make the changes. Then, re-add the 'Announcements' block: click Turn editing on, then at the bottom of the left hand block column, click on Add a block then select Announcements. For more information about adding blocks, see this article. Last, in the Announcements block, click on Add a new topic under 'Announcements' and go back to your main course page. 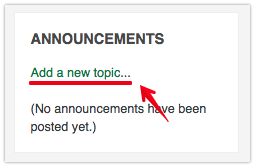 The Announcements forum should now show up on your course page.